APOLLO Global Management, Pacific Investment Management Co. and Lone Star Funds want to buy some of a non-performing loan portfolio, valued at as much as 5 billion euros ($5.9 billion), that Bank of Cyprus Holdings Plc plans to sell, according to people familiar with the matter. Bank of Cyprus is going to proceed with the so-called Project Helix offering in August, the people said, asking not to be named because the information isn’t public. The lender repeated its position that it would cut its bad loans “through both organic and inorganic activity,” according to an emailed statement from a London-based external spokeswoman for Bank of Cyprus, who declined further comment. Cypriot and European officials have been urging the nation’s banking sector to reduce the amount of non-performing loans, aiming to avoid a repeat of the island’s 2013 economic crisis. On the buyside, U.S. funds have been circling southern European bank assets, with Lone Star acquiring a multi-billion-euro Spanish property portfolio last month and Pimco eyeing a direct stake in Cyprus’ Hellenic Bank Plc. A spokesman for Pimco didn’t reply to a request for comment, while spokespeople for Lone Star and Apollo declined to comment. Despite Cyprus’ vigorous economic upswing, NPLs still weigh on banks’ profitability and have prevented significant improvement in financial health for households and companies, the International Monetary Fund said earlier this month. The European Commission and European Central Bank called on the country’s banks to prioritize reducing NPLs in a joint statement earlier this year. Other interested parties in the Bank of Cyprus loans include B2Holding ASA, a Norwegian firm specializing in distressed bank loans. It’s interested in co-investing with any buyer of the bad loans, with a view to servicing them, Rakis Christoforou, managing director of the Oslo-based company’s Cypriot arm, B2Kapital, said by phone. In June, B2Kapital completed the purchase of a package of mostly non-retail secured and unsecured exposures from Hellenic Bank valued at about 144 million euros. Bank of Cyprus reported some progress in its first-quarter earnings report, saying it had reduced bad-loan exposure for a 12th consecutive quarter. As of March 31, bad loan exposure stood at 8.3 billion euros, with a 51 percent coverage ratio, up from 48 percent at the end of 2017, meaning the bank is better able to withstand losses. Non-performing exposures shrank to 45 percent of gross loans from 47 percent at the end of 2017. 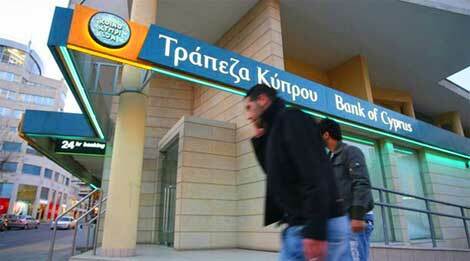 The bank is targeting a 2-billion-euro “organic” reduction in bad loans this year. Non performing loans are bought by these funds at a fraction of their real cost and then resell them or try to receive them back by contacting those who owe. For example if I am going to buy NPL’s, worth €1 Billion, I would buy them for €100 Million ONLY. Then, If I they can receive back €200 Million, they would still double their investment. When the wolves start sniffing…..
Is that €5 million or €5 billion which is one thousand times as much ??? Ed: It’s €5 billion (corrected). Now that the Cypriot Government and its attendant politicians cannot put off changing the laws on repossessions any longer they have now offered to effectively reduce the outstanding loans of those with NPL’s by 50% to avoid those very same repossessions talking place. The usual suspects protecting the usual suspects as always in this rotten to the core place. I don’t get it. Why would they buy non-performing loans. What do they get out of it?